Gold Bond Original Strength Body Powder helps you stay cool and dry and relieves and protects against skin discomfort. Trusted for generations, Gold Bond Medicated Body Powder's triple action formula is a blend of two medically proven ingredients combined with the finest powder and essential oils. The unique formula works hard to cool and soothe skin while absorbing excess moisture and stopping the itch. 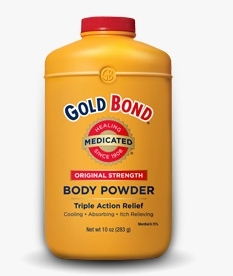 Gold Bond Body Powder is medicated to work hard, yet gentle enough to be used every day. Simply apply Gold Bond Medicated Body Powder after bathing or exercise for lasting deodorant protection that cools and leaves you feeling refreshed. It cools, absorbs, and relieves. Dries the oozing of poison ivy, oak and sumac. Stop use and ask a doctor if: Condition worsens. Symptoms do not get better within 7 days. Keep out of reach of children. In case of accidental ingestion, get medical help or contact a Poison Control Center right away.